I’m a vet and I am proud of it! How do you get your post’s message out to your community? You can think about ways to do it, you can recall how you used to do it, and you can read stories about how it is done elsewhere in the American Legion magazine. But, they are just ideas and they will never get your word across, unless you, personally, take your message to the street. Town Criers in Colonial America would walk the town commons, ring their bell, and cry out the news. It was a pretty effective means of communicating. It worked then and it still does. He was expected to be there each day, rang a bell to get everyone’s attention, and then he have something of importance to say. Can you do that today? Yes, you can. Here is how. Be visible. Wear something that shows you are a veteran or a member of the American Legion, when you are shopping, on errands, at events, at the bank, at the doctor’s, at your grocery, and just about anywhere you go. People will know you are a veteran. You don’t have to say a thing. Your attire says it all. They will see you and often thank you for your service. Be watchful for veterans, possible veterans, and their families. Vets will be wearing unit or campaign caps. Others wear patriotic caps. 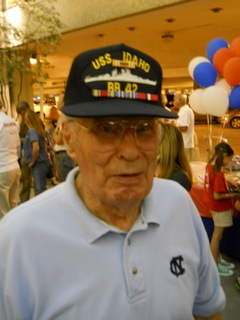 Families wear attire that proclaim military; “Go Navy,” “Beat Army,” “USS IDAHO BB-42,” “My Dad’s a Soldier,” and many other examples. Listen to their story. You can’t listen, if you are talking. Think about something that you know that might be important to them. Examples are: VA Benefits, GI Bill, VA disability claims, Aid and Attendance Care, and Veterans Pensions. If a family member, do they know about American Legion Boys or Girls State, our Oratorical Contest, or aid to veterans families. Give them a post business card that includes post information, phone number and website info. (Don’t have cards? Order free patriotic cards from VistaPrint.com.) Put your name and number on the back. Ask them to visit your post’s website for information on what you talked about. Let them know that the American Legion is there for the community. Invite veterans to visit your post to take a look. Make sure that they know that we are not a bar, we don’t smoke in our post, and we are not a supper club. Tell them about the family based facilities and amenities at your post. Don’t forget to mention your community activities and post events that involve families. People will get to know the American Legion through your visibility, activity, community service, and actions. That’s the ring in your bell. You clang that bell by keeping your post’s name and activities in their face. Advertise what you do with press releases, news stories heralding what you have accomplished, Legion programs and events, speaking at schools, visiting senior centers, and by drawing attention to the community service of American Legionnaires. Can you hear the Legion bell clanging in your town? If not, take the lead and show your post how to do it. Learn more about things you can do to build a better post through public relations and speaking by requesting help for your post. Click here to ask for help. Include your home phone, post, and need.